May 15, 2012 - AgustaWestland, a Finmeccanica company, announce that the first prototype of the AW169, a new generation 4.5 ton light intermediate helicopter, successfully completed its maiden flight. The AW169 program is on schedule to achieve basic civil certification in 2014. The AW169 was flown by AgustaWestland’s Chief Test Pilot, Giuseppe Lo Coco, Test Pilot Giuseppe Afruni, and Flight Test Engineers Massimo Longo and Stefano Rognoni at the company’s Cascina Costa plant in Italy. The helicopter performed as expected during the flight which included an assessment of the helicopter’s general handling and basic systems. The first prototype will be joined by two more aircraft later this year and a fourth prototype in 2013. 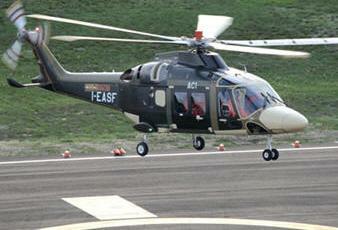 The AW169 is part of AgustaWestland’s family of new generation helicopters that includes the AW139 and AW189 models. These helicopters all possess the same high performance flight characteristics and safety features and share the same common cockpit layout, design philosophy and maintenance concepts. This approach will deliver real cost savings in areas such as training, maintenance and support for existing operators of the AW139 who add AW169 and/or AW189 helicopters to their fleets. Launched at the Farnborough International Air Show in July 2010, the AW169 has rapidly found market success, logging orders for more than 50 units so far from customers worldwide. A versatile, new generation twin engine helicopter, the AW169 has been designed in response to the growing market demand for an aircraft that delivers high performance, meets all the latest safety standards and has multi-role capabilities. The AW169 incorporates several new technology features to provide the highest levels of safety and operational benefits for its customers. New generation technologies are incorporated in the rotor system, engines, avionics, transmission and electric power generation and distribution systems. Latest technologies include an APU mode capability and touch screen cockpit devices. The AW169 is set to be the most advanced and cost effective helicopter in its class for EMS, SAR, law enforcement, passenger and offshore transport and utility missions.